Huda*, 40, is an Iraqi refugee living in East Amman along with her two sons and two daughters. She has been in Jordan for the past three years where she had to flee her home town in Iraq after her husband died in the war. Her eldest son Tamer*, 17, has not gone to school for over five years now because going to school during war time in Iraq was almost impossible for boys Upon their arrival to Jordan, he was the only breadwinner for the family. He used to carry heavy bags of rice and other food items every day in order to provide for his family. 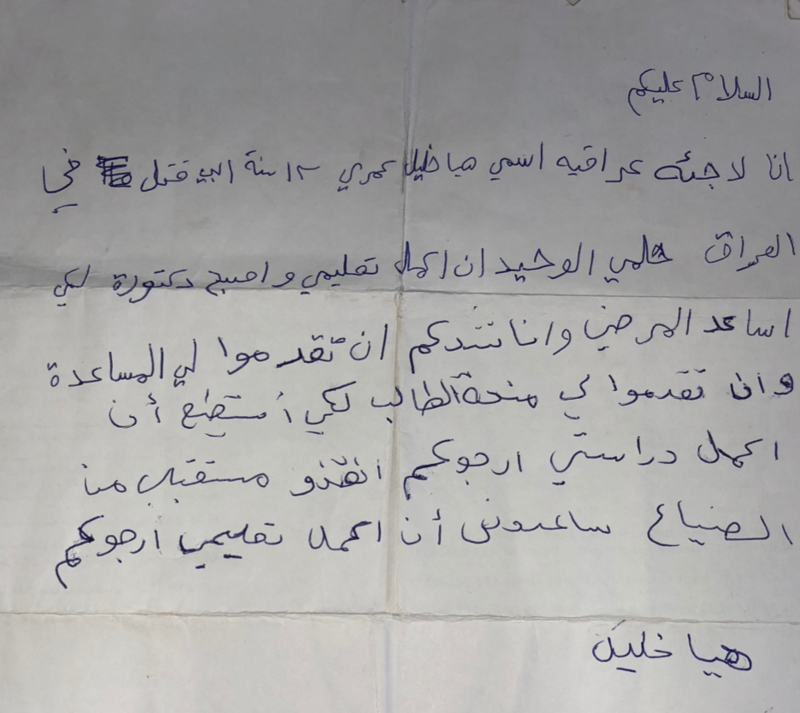 But Tamer got caught working by the police, and as a minor and a refugee the police made his mother sign a paper promising that if he was caught working again, he would be imprisoned. With that went the family’s only source of income. Back in Iraq, Huda didn’t have to work a day in her life. Her responsibilities were limited to taking care of the house and the children, while her husband drove a transportation truck, and provided for the family. “I really never worried about expenses, rent, or money because my husband just gave it to me. It never occurred to me that it would be this difficult to support a family”, explained Huda. Given the very vulnerable state that the family were living in, Manal*, 16, Huda’s oldest daughter, started receiving marriage proposals. It was only natural to Huda, given all the pressure that the family was under, for Huda to accept a marriage proposal and send her off with a 20-year-old husband. She has been married for the past year. “I ruined my daughter’s life with my own hands. She didn’t enjoy her childhood, and she missed the chance to live like most girls her age do.” Said Huda, “And I will not let myself or anyone do that to my other daughter.” Manal missed the chance to have a normal childhood, and a normal life. Fadel, 7, is the youngest member of the family, and the only one currently going to school, in the second grade. Although he is very good at school, and loves it, he misses many days of school “Sometimes I really don’t have a single penny to send him to school, so he misses school and gets angry with me. I let him get angry because there is no way to explain to him that I can’t send him to school because of money.” When asked how Huda makes ends meet, she explained that they are living mainly on charity. “Sometimes our Jordanian neighbors cook more food than they eat, so they give us the leftovers, and we usually only have one meal per day because I cannot afford more than that. I’m also late every month for paying the rent but the landlord is a kind, forgiving man.” The family of five lives in a small house in East Amman. Worried about Haya’s future, Huda started to look for solutions, and heard from her fellow refugee friends that CARE is providing families with cash on the one condition that they send a child back to school. Happy about the news and the possible solution for her youngest daughter, Huda told her daughter who was so happy that she decided to address CARE differently. She wrote a letter explaining why she should be accepted in the Conditional Cash for Education Program. I am an Iraqi refugee, my name is Haya Khalil, and I’m 13 years old. My father was killed in Iraq. My only dream is to continue my education and become a doctor so that I can help sick people. I urge you to help me and give me a student fund so that I can continue my education. Please save my future from being lost and help me finish my education please. Learn more about our work in Jordan.